Venezuelan President Hugo Chavez is sending thousands of troops and tanks to the border with Colombia, marking a sharp escalation in regional tensions. Speaking on his weekly television show, President Chavez also said Venezuela's embassy in Colombia would close. Mr Chavez said he was reacting to the "cowardly murder" of a leading Farc rebel by Colombian forces in a raid just inside Ecuador on Saturday. Later, Ecuador recalled its ambassador to Bogota in protest at the incursion. Raul Reyes and at least 16 other rebels were killed in the operation, which took place about 1.8km (one mile) inside Ecuadorean territory. Mr Chavez has been mediating with the Revolutionary Armed Forces of Colombia - or Farc - to secure the release of hostages the rebels hold, and six have so far been freed under this initiative. But he lamented the killing of Reyes - whom he called a "good revolutionary" - when he spoke on his show, "Alo, Presidente". 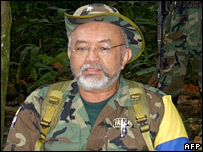 Colombia's defence minister had described the death of Reyes as the "biggest blow so far" to Farc. 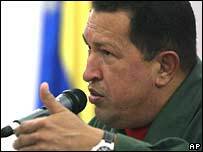 But Mr Chavez described the strike as "a cowardly murder, all of it coldly calculated". He said Colombia "invaded Ecuador, flagrantly violated Ecuador's sovereignty". Mr Chavez addressed his defence minister, asking him to "move 10 battalions to the border with Colombia for me, immediately" - a deployment likely to involve several thousand soldiers. "The air force should mobilise. We do not want war. But we are not going to let them... come and divide and weaken us." He ordered the Venezuelan embassy in Bogota closed and said all embassy personnel would be withdrawn. Mr Chavez had earlier warned Bogota that any incursion into Venezuelan territory similar to Saturday's operation would be a "cause for war". Later, Ecuador announced that it too was taking punitive measures against what it terms an illegal incursion, and had recalled its envoy to Colombia. But this is not a full severance of ties, as commercial relations will remain intact, said officials at the country's foreign ministry. In his address, Mr Chavez said Ecuador's President Rafael Correa had also agreed to send troops to the border, Associated Press news agency reported. President Correa has complained to the Colombian government about its incursion, calling it "scandalous", and a formal protest has been lodged with Bogota. Colombia's government has received billions of dollars in aid from Washington to fight the guerrillas - as the US, along with the EU, views Farc as a terrorist organisation. Colombian troops have recently retaken control of areas previously held by rebel groups, but Farc retains a strong hold over Colombia's more remote regions.